What is Your Perfect Pen and Why? From time to time we suggest and pick particular themes for our meetings. Those themes have to only loosely be related to pens, inks and papers. The theme for April 3, 2010 was for each member to bring the pen from his/her collection that they would consider the “perfect” pen (for him or her) right now and explain why they chose that particular pen. – How the pen fits them? (smoothness level, flow rate, stiffness, and point size/shape)? – How durable is the construction? – How it matches their esthetic tastes? – How easy it is to fill and how it matches their ink capacity requirements? – We might even find that there are some repetitions. – It’s the pen that David wants more than any other from his collection but can’t have it. – Nib is ‘right’ – It’s neither fine or medium or broad, it is just right. – Construction – Screw-on cap (when posted to end of barrel). At first he thought it was a hassle and stupid. Now everything lines up. Cap never falls off. – Perfect flexible nib – almost calligraphic. It would be interesting to compare the results of this exercise if these same question was asked a year from now. We’d love to hear what your perfect pen is and why? Maybe you think the same as some of our members or maybe something completely different. Let us know! y first memory of writing with a fountain pen goes back to my pre-primary school, Chelmsford School in Durban, South Africa where as an 8 year old in what we then called Standard 1 (Grade 3), we were to taught to write with a fountain pen. Sadly, I don’t remember the details of the pen, except that it was not a dip pen. While those memories have faded, a small spark was created. 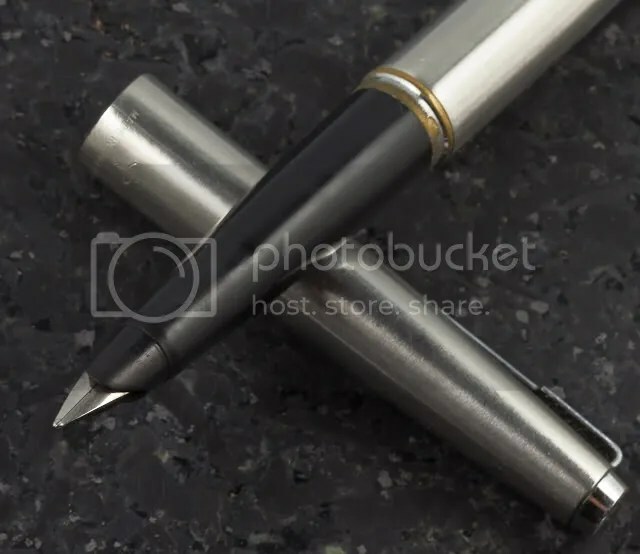 The first pen that I ever owned was a Parker 45 Flighter, the stainless steel super-stream-lined classic given to me by family friends when I was 13 years old. This turned out to be a most appropriate first pen for me, as the Parker 45 and I share birth years, give or take a year. I loved this pen and used it often over my high school and university years, and beyond. This pen still writes as well as it ever did with its smooth medium nib, and like many 45s, the plastic section long ago developed the characteristic bumpy indents caused by the clutch rings of the pen’s cap. These days, I no longer use this pen, preferring others, but it still holds an important place in my collection, where it has been joined by a number of 45 cousins. When I was in my late teenage years and heading off to university, my father gave me his black aerometric Parker 51, personally inscribed with his name. At that time, he no longer used a fountain pen and I was delighted with this 2nd addition to, what I did not know then was, my “collection”. This pen, with its simple lustraloy cap was and is a classic, and kindled my love of 51s. I never used the pen very much because it had a fine and scratchy nib. Then, living in Canada, I eventually sent it off to Fountain Pen Hospital to get a new medium nib installed, which transformed the pen into a usable instrument. Subsequently, the pen visited John Mottishaw who fitted it with a stub nib, a transformation which made it an even more usable pen. My father was not the only 51-owner in my immediate family. My mother, presently a few weeks short of her 90th birthday, has been doing all of her daily writing with her beloved burgundy aerometric 51 (with gold-filled cap), for over 60 years. And for over 30 years now, I (and my brother) have received a weekly letter from her, penned with no other pen than this burgundy 51 filled with Parker blue ink. One day, I hope to own this pen, something with which my mother concurs, although as she has said, “hopefully not in the near future”. Prior to starting to collect fountain pens seriously in 2008, three other fountain pens joined my infantile collection. 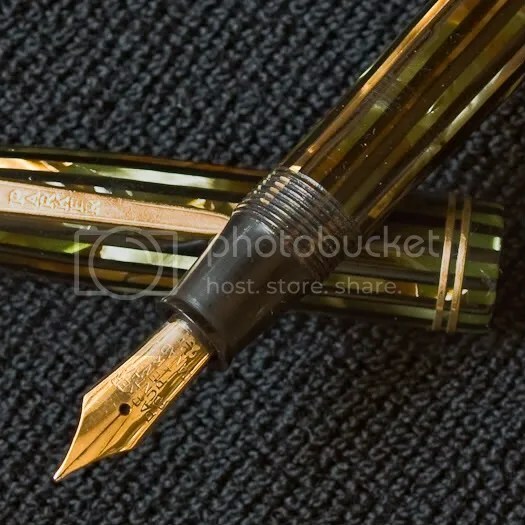 Sometime between 1997 and 1999, I made my first Ebay purchase in the form of a green and gold striped Parker Duofold Junior from 1946; I am not sure what made me buy this pen as I was not “collecting” fountain pens then, but presumably “collecting” was then in its embryonic and inevitable state. In 1999, I was given a beautiful white swirled Marlen Shuttle with sterling silver cap by friends when visiting them in Phoenix. Following this, there was a brief dalliance with an orange Rotring Core purchased from the Peel Pen Store, until the collecting hobby was born formally in 2008.